Ownership / Access: Youth centre. 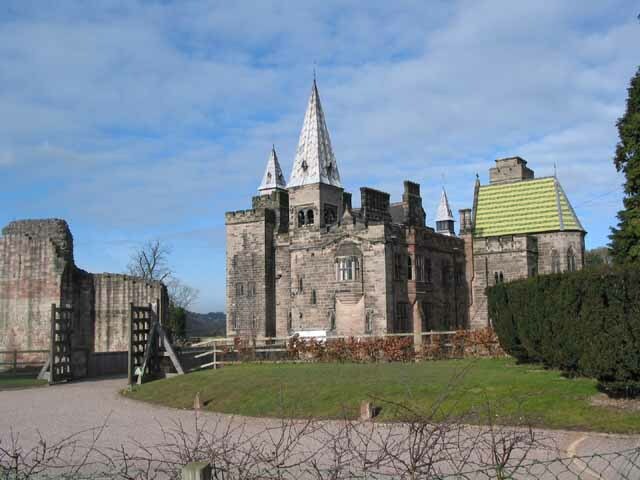 Notes: Alton Castle is a Gothic-revival castle, located on a hill above the Churnet Valley, in the village of Alton, Staffordshire. The site has been fortified since Saxon times, with the original castle dating from the 12th-century. The current castle was constructed in the mid-19th-century by John Talbot, 16th Earl of Shrewsbury, of near by Alton Towers. Since 1967 the castle has been designated a Grade I listed building. It is also a scheduled ancient monument. Alton Castle is now in its 15th year as a residential youth centre and UK registered charity working with children aged between 9 and 13 years. Over 8,000 children visit the Castle each year, mainly with schools, but also from other children's organisations such as youth groups and charities who work with children with disabilities. Some of the children have suffered disadvantages, including disability, and many come from inner city areas of social and economic deprivation. Alton Castle aims to raise self-esteem, to strengthen and build friendships, and to help each child realise their potential as human beings. The children participate in a variety of activities during their stay including mountain biking, trekking, archery, rockclimbing and survival.